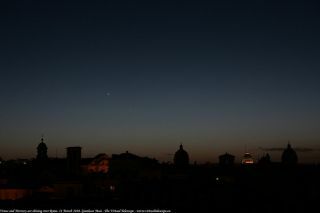 Venus (top left) and Mercury shine over Rome, Italy in this photo taken on March 31, 2010 by Italian astronomer Giancula Masi. An Italian astronomer has caught the rare sight of Venusand Mercury together in the night sky in a snapshot of both planets shiningdown on Rome. Astronomer Giancula Masi snapped the stunning photo ofVenus and Mercury on Wednesday night while looking west after sunset in Rome,Italy. The result: a serene scene of planets and architecture. Venusand Mercury are locked in a celestial dance of sorts over the next fewweeks, treating skywatchers to a chance to spot the usually tricky planetarytarget Mercury by using bright Venus as a guide. This viewing map shows where to look tosee the two planets. Between March 28 and April 12, Mercury willbe within 5 degrees of Venus (the length of your clenched fist held at arm'slength is about 10 degrees). So Venus is a convenient guidepost to locate thenormally hard-to-find planet [moreVenus photos]. ?Around 30 to 45 minutes after sunrise looklow toward the west-northwest horizon,? he wrote last week. ?You willimmediately spot brilliant Venus. Hovering below and to its right you will seea bright yellowish ?star.? You?re looking at our solar system?s so-called ?elusive?planet.? Read more about Mercury. Masi used a digital reflex camera and a wide-field lensto catch the planetary dance of Venus and Mercury. ?It was a memorable experience for me to go close to ?Campidoglio?and looking up for those cosmic jewels, finding them above that stunning panorama! ?Masi said.